So as regular readers will know most of my articles on home gym equipment and strength training have focused on barbells and barbell based exercises (such as the squat, deadlift, bench press and overhead press). 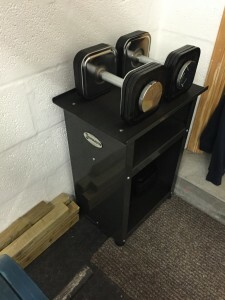 Now we will look at another great piece of equipment for free weight training – adjustable dumbbells. These really come into their own when trying to build strength via assistance exercises or looking to add size/mass with an increased focus on bodybuilding. Having had a home gym for a little over 3 years the one thing I missed about a commercial gym was the dumbbell rack. But that would be a whopping 96 dumbbells to store somewhere in your garage/basement gym! Instead all I have is a little stand off to the side by my squat rack. The sensible solution for personal use is then to get a set of adjustable dumbbells – as the name suggests these are principally one pair of handles with a way of incrementally adding/subtracting weight in order to get a range of weights you can workout with. 2) Cheaper – when building a home gym we all look for the best value for money – pound for pound adjustable will come in much cheaper than a full rack. The downside is, without exception, an element of inconvenience when changing weights. It takes a minute to sort this out where a full rack you could just pick up the next size. When looking for selectable sets I quickly discounted non-premium products (no name sets, Bowflex, spin lock collar systems) as having experienced some of these previously I knew I wouldn’t trust these over my head/face so would rather invest a little more in a more sturdy product. The two primary brands around are Powerblock and Ironmaster – both produce great kit and have their own fans. I went for Ironmaster in the end, and I will explain why. Line up is confusing – Ironmaster have one dumbbell product with 2x additional expansion packs (purchased separately) to increase capacity. Powerblock have three lines (Urethane, Sport, Classic) with 8 different products. I prefer the simplicity of the Ironmaster here as I didn’t see much differentiating the Powerblock varieties & was concerned I would end up with the ‘wrong’ one. That said, Powerblock make it easier to spread the cost. You can buy the handles, Stage 2 expansions and stand separately meaning it’s quite affordable and reasonable to build up over time. Speed of change – Powerblocks have a unique box-y look that is partly derived by their latch system for weight changes. It is VERY quick to change weight (a few seconds) with their clip. Ironmaster takes longer (vid below). If you dropset at different weights then Powerblock is the way to go. For me personally I tend to rest for a minute or two (at least) between sets so changing the Ironmasters, while more time consuming, doesn’t negatively impact the workout. Feel – ultimately it was this that swung it for me. I was looking to replicate the feel of a rack of dumbbells. Ironmaster Quick-Lock when assembled looks like a traditional dumbbell and the lock mechanism is TIGHT, and I mean TIGHT! Absolutely no rattles. Genuinely when using these you wouldn’t know they were weight adjustable. Feels just like a fixed dumbbell. Awesome! I’ve owned these for around 6 months now and have had time to get REALLY familiar with them. I’ve mentioned above the cost & feel of the dumbbells so I’ll focus more on the actual build of the product here. The stand – full disclosure, I thought the stand was going to end up in the bin. The reality – it’s a brilliant place to 1) keep all the weight plates, dumbbell handles and lock pins together; 2) worktop to change the weight & 3) generally keep them tidy and out of the way. The handles – Much bigger than they look on screen, the handles weight 5lbs each and feel STURDY. I was pleasantly surprised to find the knurl medium to medium/aggressive so when gripping it you can feel the purchase on your palm. The (patented) Quick Lock mechanism – I love the simplicity of this, each pin has around ¼ of the circumference tapped and the handle interior ¾ of it’s internal circumference tapped. You simply drop the pin in to the approximate depth in the channel within the handle (marked with a V on the side for ease), then a partial turn locks it in place. So simple. Each pin weights 2.5lbs, so an empty handle with the pins weighs 10lbs. The weight plates – Weight is weight in my eyes, so not much to add. Come in two sizes – 5lbs / 2.2kg and 2.5lbs / 1.1kg and all plates mate perfectly to the handles. 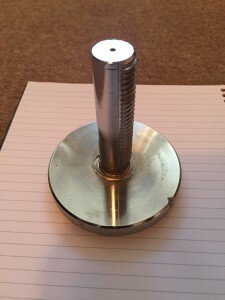 The plates are machined to fit TIGHT – my one complaint is when stacking them they nip my fingertips as they are so close when dropping into place! I’m very pleased with Ironmaster, the quality was a real surprise. It feels almost commercial when in use and there are absolutely no rattles. 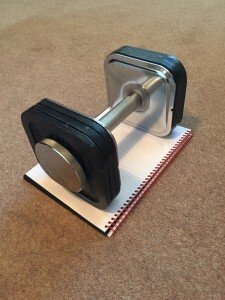 I genuinely do forget it’s an adjustable dumbbell – and, after all, is that not the point? While I never drop a weight, at the end of a set putting a heavy dumbbell down can result in a bit of a bang. Even then the Quick Lock holds tight and there are no rattles. I’m really surprised by this – what a tight fit everything is to prevent clangs and rattles. Having worked with metal Olympic plates for a while it can be quite noisey in a small garage when every set is followed by a BANG! Do yourself a favour and GET SOME OF THESE – the best adjustable dumbbells you can get for a small space!